Palms Trading Company is proud to offer the work of many celebrated Native American Indian artists. This month, we’re featuring award-winning San Ildefonso potter Erik Fender! Erik Sunbird Fender (Than Tsidéh) was born in 1970 to an illustrious family of San Ildefonso potters. At age 10, Erik began to learn the art of pottery from his mother and his grandmother. Erik’s interest in color and painting earned him an award at a Congressional art competition. But it wasn’t until 1992 that he began to work closely with his mother in the traditional black-on-black style of San Ildefonso pottery. Erik comes from a long line of San Ildefonso potters. His great grandmother, the famous Maria Martinez, helped preserve traditional pottery making techniques that were being lost in the advent of ready-made materials. In the early 1900s, a professor of archeology and director of the Laboratory of Anthropology in Santa Fe, Edgar Lee Hewett, approached Maria. His request was to help him revive the traditional pottery-making techniques that had created the pots and pot shards he had found at nearby archeological sites. Through observation of the pottery-making techniques in nearby Santa Clara Pueblo and experimentation, Maria was able to bring the ancient art back to life while adding her own techniques and designs. Maria passed these techniques down to her children, grandchildren and great-grandchildren, including Erik Fender, his mother Martha Appleleaf, and his grandmother Carmelita Dunlap, both well-known potters in their own rights. 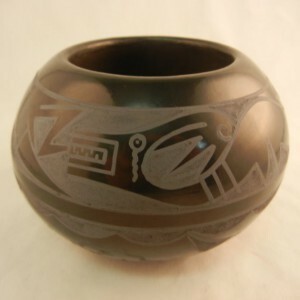 Erik specializes in both traditional and contemporary San Ildefonso pottery. He uses various techniques and clays to produce traditional black-on-black pottery as well as innovative two-tone and polychrome pots. Each pot is hand-coiled using clay he mixes himself, as well as hand-sanded and hand-polished once the clay is dry. Natural paints made from native vegetation are used to decorate the two-tone and polychrome pots. Erik Fender remains true to his great-grandmother’s spirit of experimentation and innovation, and at Palms Trading Company, we are proud to offer his incredible works of art!